Williams was a civil rights activist, Hudson said, but “more through financial backing than walking a picket line.” He was a life member of the NAACP, and co-founder of a bank founded to provide mortgages in redlined black neighborhoods. 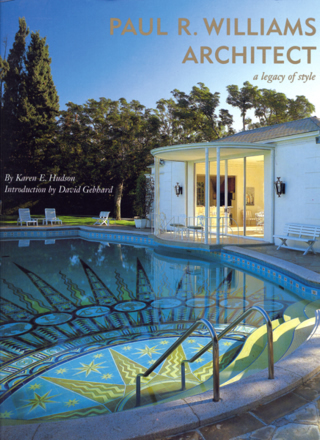 One of the three books Karen Hudson authored about her grandfather, 1993's Paul R. Williams, Architect: a Legacy of Style. Singly is certainly how Paul Revere Williams moved forward. His parents died young, and he was raised by a family from their Los Angeles church. His foster father was a janitor. For a time, Paul was the only black child in his elementary school class. Williams studied at the Los Angeles School of Art and—via mail—at the Beaux-Arts Institute of Design. He studied engineering at the University of Southern California but didn't graduate. Meanwhile, he earned cash manufacturing furniture and pocket watch fobs, employing five or so workers. He worked for a series of white architects, several of them prominent, and one of whom, Reginald Johnson, became a mentor. To his fans, greater Los Angeles is a Paul R. Williams museum. In general, a Williams tour will take in places like Holmby Hills, Hancock Park, or Lafayette Park—places known for fine, individually designed homes. Williams is not known for tract homes. Yet it is with tracts that he made an early mark—designing a group of Period Revival homes in Flintridge from 1928 to 1930. And during his 50-plus-year career, Williams designed several other neighborhoods, ranging from public housing to a development of 155 homes built in Las Vegas in the early 1950s for working-class blacks. 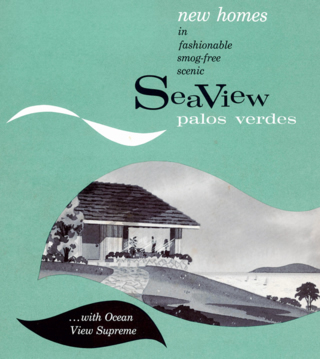 So why is it that his largest and most modern neighborhood tract, SeaView Palos Verdes, in Rancho Palos Verdes, about 190 three- and four-bedroom homes designed by Williams in the late 1950s, remains so little known? Many people who live there don't even know it was designed by one of Los Angeles' greatest architects. If resident Mark Morgan has his way, though, SeaView will regain its fame as a Williams neighborhood by receiving historic-district status. “The great thing about Paul Williams' modern homes in SeaView Palos Verdes is that he brought the glamour of his designs for Hollywood stars to the affordability of the middle class,” Morgan says.